I love EPP, too. I carry my kit all over the place with me. 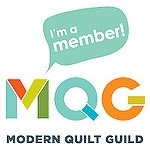 It turns me into a quilting ambassador wherever I go. Yes, and people are always curious about how you get the paper out! Wonderful post! I have my EPP kit ready for when I go back to work after maternity leave. I really love those EPP pluses. They help to bring this technique modern. Enjoy your EPP project when you go back to work. Those lunch break moments can add up! Lovely blog…I should have read it before leaving to stay @ Lake Crescent Lodge. I took the Dorothy towel project…. did not get one stitch done! But what a beautiful Friday. Thanks for the Anna Blog reminder…..she has her site set up to easily navigate all the info, while keeping things neat tidy and out of site until you scroll over. And what incredible piecing and fabric combos. No fear or timidity in that girl. Oh well off to dinner and probably no stitching again. Thanks for visiting! I agree that Anna’s website is beautiful and the information is easy to locate. Hope you get some stitching in soon! Thank you for sharing your lovely EPP projects. I am just starting a hexie project and am in basting phase. I can see what you mean – it’s a very portable and potentially addictive process. I’ll look forward to seeing what you make with your hexies. It’s always great to find another fan of EPP! I admit, I have no plan for my Lucy Boston blocks. I’m just sewing them together because I enjoy the blocks – I haven’t decided how big I’ll make it, what I’ll do with the quilt when it’s done, etc. I was thinking of doing a variation of La Passacaglia quilt when I’m done with this one – but no hurry. I missed the webinar, thanks for pointing it out! I just went to Wild Olive and saved the Plus template. I love you variety in colors. How big are you planning to go?